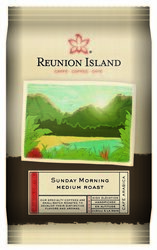 Reunion Island Sunday Morning Breakfast Blend. An upgraded take on the classic breakfast blend raises the bar on quality with a balanced blend of high-grown Central and South American coffees. The beans are hand selected to create a smooth body with a tasty toasted nut and citrus notes. Each case has 24 bags of 2 oz coffee.